Russia’s capital pushes to match cities such as Rome and Paris in tourist amenities. Moscow is one of the world’s top-ten cities currently enjoying a tourist boom. It has moved up to 4th place on Tripadvisor.com. Accordingly, the city has launched a tourist pass that will allow visitors to access museums and tours at discounted rates. Looking to maintain the balance between tourist traffic and the city’s growing infrastructure, Moscow authorities hope to tackle transportation and language issues for visitors next. With traveler interest in the Russian capital growing, Moscow has finally acquired some of the features of the world tourist center that it is. A year ago, Moscow set up a call service offering information about the city in six languages. In the summer, Moscow launched double-decker tour buses – something that Muscovites have not seen since the 1950s. 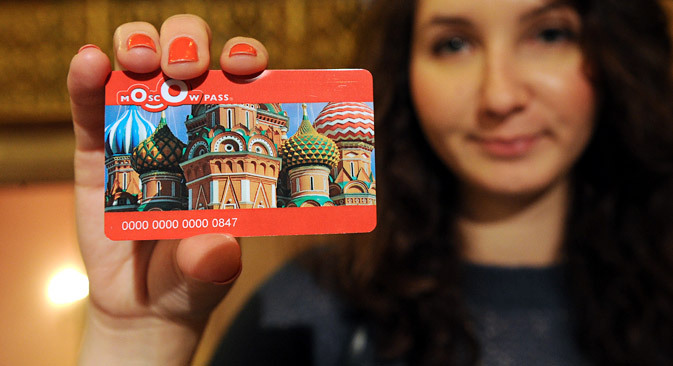 The city is getting ready to offer another service that is popular at major tourist destinations, as visitors will be invited to buy a Moscow Pass: a plastic card providing entry to Moscow museums, tours and tourist services at discounted rates. Stockholm was the first city to issue such cards, back in the 1980s. From Paris to New York, many big cities have sightseeing passes for tourists. London offers the London Pass, which is available from around $75-$240, depending on the duration and range of services available. The pass entitles holders to enter several dozen museums, galleries and visit historical monuments. The only Russian city offering such a pass so far is St. Petersburg. The city’s “guest card” is sold at 2,700 rubles ($87) and serves as an entrance ticket to 38 museums. The Moscow Pass is available at 2,400 rubles ($77) and currently covers only seven museums. Organizers of the project promise that, by the start of the tourist season, the number of museums will increase, as there are several hundred museums in Moscow. The project will focus not only on Moscow landmarks but also lesser-known sights. As for the price of the pass, it may be reduced. “This is economies of scale – the more we sell, the more customers we have for our partners and the better offers we get from them. When it comes to the price, we will base ours on how much passes of this kind cost in the West,” said Zemskova. The Moscow Pass is currently accepted at the State History Museum, the Cathedral of St. Vasily the Blessed, the Museum of the History of Corporal Punishment, the Multimedia Art Museum, the Museum of Contemporary History of Russia, the Moscow War of 1812 Museum and the Museum of Russian Icons. The Moscow Pass also offers a free walking tour, a cruise on the Moskva River and a tour of Moscow in a double-decker bus. The Moscow Pass will go on sale in mid-December. The card will be available at hotels, museums, hostels, and online at www.moscowpass.com. Later, the pass will also be made available at airport shuttle stations. “We are in talks with travel agents from Europe and the U.S., in order to offer the Moscow Pass abroad,” said Ksenia Zemskova. Unlike Western sightseeing cards, the Moscow Pass does not entitle its holder to use public transport free of charge. Tourists who do not speak Russian will have to use signs and gestures to buy bus or metro passes, because most cashiers in Moscow do not speak English. In any case, the city authorities plan to address this problem next year. In the first eight months of 2012, the number of foreign visitors to Moscow went up 17 percent. The Tourism Committee expects the number of tourists to reach 5 million by the end of the year and 7 million by 2016. Paris, the world’s most popular travel destination, welcomes more than 20 million tourists every year.